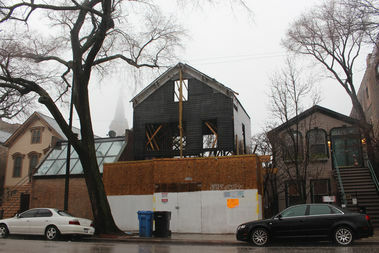 With the steeple of St. Michael's Roman Catholic Church in the background, the building at 1720 N. Sedgwick Ave. stands in the rain Thursday with no roof , no tarp and open walls. OLD TOWN TRIANGLE — The city has moved to seize control of a historic landmark district building that it says has been left to rot at 1720 N. Sedgwick Ave.
"We believe that this owner is allowing the building to deteriorate so he can obtain a demolition permit," said Ald. Michele Smith (43rd), after she joined in a city complaint against owner Joseph Younes in housing court on Thursday. Associate Judge Patrice Ball-Reed agreed, granting the city the right to appoint a temporary receiver to secure the building and get a report done on its structural integrity. Younes, however, took issue with the charge that he's out to raze the house. "We did not want to demolish this building from the start," he said. "We wanted to save it." The city recently slapped a stop-work order on the building for exceeding work allowed in a permit to fix the foundation. Younes insisted he and his contractor got stuck in a bind between needing to make immediate repairs and the involved process of getting permission for those repairs from the Commission on Chicago Landmarks for a building in the Old Town Triangle Historic District. The city filed a complaint against Younes after inspectors recently issued a stop-work order on the building, charging that the work had exceeded a permit allowing the foundation to be shored up. Younes said that, while doing the foundation work, he and the contractor made a snap decision to replace a key structural beam and remove the roof to ease stress on the walls. "My contractor said if it was allowed to remain in that condition, it could fall down at any time and injure pedestrians and passersby," Younes said. "So we made a judgment call at that moment in time, and said this stuff has got to come down." The judge ruled that was in violation of city permit processes in the landmark district. Smith added that, as of Thursday, amid heavy spring rains, the house still had no roof and missing walls, with no tarp or other form of protection. "There's a serious danger of this building in a landmark district simply deteriorating because it hasn't been properly cared for during the rehabilitation process," Smith said. "We want to send a message to anyone who possesses properties and is not maintaining them that we'll do everything in our legal power to make sure the Old Town Triangle is preserved." According to Smith, Younes could never get agreements with the Buildings Department and the Landmarks Commission "because he seemed to be dragging his feet all the time." "Now we have this guy we think is willingly letting it deteriorate," she added. "We're not going to let that happen." Jordan Matyas, who represented the Old Town Triangle Association at Thursday's court hearing, said Younes was being disingenuous in saying he didn't intend to level the site. 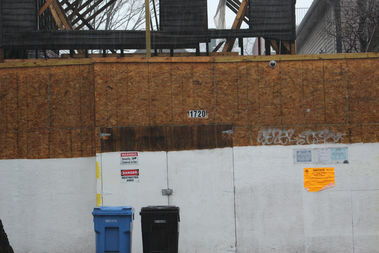 "He's told me twice that he always wanted to demolish it," Matyas said, and he told the judge that he intended to pursue a demolition permit as well. "So we have some mixed signals from the owner, but his actions speak clearly about his intent for the building." Younes, however, said he was in a bind with the city where he's damned if he does something, and damned if he doesn't. He added that it was Smith who failed to act when, after he bought the building for $833,000, it took him years to evict the previous owner, a "hoarder" who allowed the place to fall into disrepair and become infested with rats. Younes said if he'd been granted power over the property sooner, he might have been able to do more to save it. "The building was built in the late 1800s," he said. "This building rotted itself." According to Younes, all the architects he's consulted have said the building cannot be salvaged, contrary to the city's position. "What they want is for a structural engineer to say the building is structurally sound. And nobody wants to sign off on it. The building is too old," Younes said. "Up to now, we can't find anyone who's willing to sign off. If they can find someone who's willing to sign off and tell us how to do it, we'll be ecstatic." Of course, city attorney Greg Janes argued in court Thursday that's exactly what Younes wants, to be told it's permissible to demolish the building. Both sides will be back in court for renewed arguments at a follow-up hearing set for April 27, and before that it's expected to be on the agenda for the next meeting of the Commission on Chicago Landmarks on April 6.